The Swiss are known the world over for the high value they place on precision. Not surprisingly, Swiss watch brands set the global gold standard as far as watch and chronometer quality are concerned. Similarly, the Swiss preoccupation with precise ingredient mixing technology and processes have made Swiss chocolate the prize of chocolate fans from all four corners of globe. This Swiss obsession with precision to produce topnotch quality is at play with the Swiss Diamond 6428ic Induction Nonstick Fry Pan. This 11 inch cast aluminum work of high precision industrial art delivers the quality and value one would expect from the Swiss. Whether judged on its premium features, long-term value proposition, ability to cook under a wide variety of conditions, ease of use, ease of cleanup, and overall ability to deliver value over the long haul, this costlier model delivers. It’s definitely worth the extra bucks. 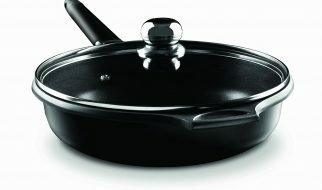 What makes the Swiss Diamond 6428ic Induction Nonstick Fry Pan stand out is its non-stick surface and its interior. First, this unit’s non-stick surface has absolutely no health-jeopardizing PFOA. Completely non-stick, you are assured of healthier meals because you can confidently skip the oil in all your dishes with this pan. Whatever you’re cooking, you are assured high induction heat that makes cooking meals faster and more efficient. Best of all, this fry pan’s non-stick surface uses actual diamonds. You get diamonds’ durability and ability to withstand a tremendous amount of punishment while being assured of a light profile that is easy to work with and move. Interestingly enough, diamonds are also very powerful heat conductors. In fact, they conduct heat more efficiently than metal materials. This pan also stands out in terms of interior pan design. 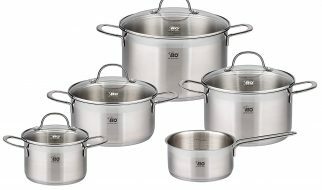 One of the most common headaches both home and professional cooks have with cookware is when food gets stuck on the tiny crevices of the rivets in the interior of the pan. These rivets connect the pan with its handle. Talk about unhygienic! Regardless of how many times you run the pan through water or wipe it down, it’s very difficult to get rid of that debris. You won’t have this problem with the Swiss Diamond 6428ic Induction Nonstick Fry Pan thanks to its rivetless yet durable design. 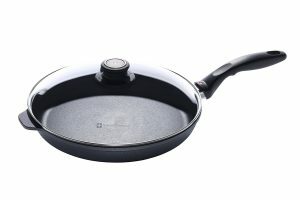 Thanks to this pan’s diamond-based non-stick coating as well as its rivetless design, chances are quite good you’ll probably use this pan as your ‘go to’ fry pan. It’s easy to see why this would be the case. It conducts heat rapidly and it is very easy to clean. Also, the rotating knob on its glass lid enables you to regulate the steam your food generates to maximize and speed up cooking. You get a quick and easy way to regulate food moisture without having to lift the lid. Not only do you easily see how far along your food is from being done, you get a tremendous amount of control over its moisture content thanks to this model’s easy steam regulation system. As far as construction is concerned, this 11 inch pan is made of cast aluminum-a heavy duty design that guarantees the body of your pan will be warp-free for life. Designed for induction cooktops for optimal magnet-produced heating, this Swiss cookware can also handle electric and gas range heat sources. You can even use it in an oven with heat settings as high as 500 degrees. This skillet’s heavy capacity (it can easily large meals’ portions) also adds to its versatility. Regardless of the amount of food you’re preparing, its large bottom is sure to deliver solid heat where it needs to go for faster and more effective cooking. Regardless of your recipe, you can be sure that your food will be heated properly through induction since this unit’s diamond-based non-stick surface conducts heat so efficiently while absorbing a tremendous amount of wear and tear. Since this skillet’s surface is coated with actual diamonds, you get a sturdy non-stick surface that can take quite a beating and still ensure food slides off. Not surprisingly, you can expect a very quick, easy, and convenient clean up process. There’s no need to soak this cookware in soapy water and wait several minutes or even hours. Nope. You only need to wipe it down with a sponge dipped in soapy water. One or a few swipes are enough to clean off debris. Run the cookware under your faucet’s water and you’re done. Clean up is so efficient and quick-just like this unit’s cooking time. One key clean up point that needs to be emphasized is this unit’s rivet-free design. The handle isn’t attached to the main pan through rivets. That’s why there’s no indentations in the food pan where ingredients might get stuck. You no longer have to worry about soaking your pans just to get rid of hard to reach food debris. You only need to wipe down the interior of the skillet to clean it up. From its use of diamonds in its non-stick surface to its cast aluminum construction, this model is intended to withstand the test of time. Diamonds after all are very sturdy. You can rest assured that the non-stick surface of this unit will continue to do its job even after many years thanks to diamonds’ ability to not only transmit heat efficiently but their natural tendency to resist sticky materials. The result is a great combination of durability in a powerful metal frame that can take lots of knocks and banging over many years. This is Swiss precision and attention to design details at work. Given its durability, high quality non-stick surface, solid construction and precise engineering, you can rest assured that you will get more bang for your cookware buck with this model. The diamonds that make up the Swiss Diamond 6428ic’s surface are not the only gems it features. The whole pan itself is a gem compared to competing brands’ offerings.